Why fly weights are driven at a higher rotational speed than the engine? * Fly weight equipped governors work on centrifugal force. The centrifugal force acts upwards and the spring force acts downwards. 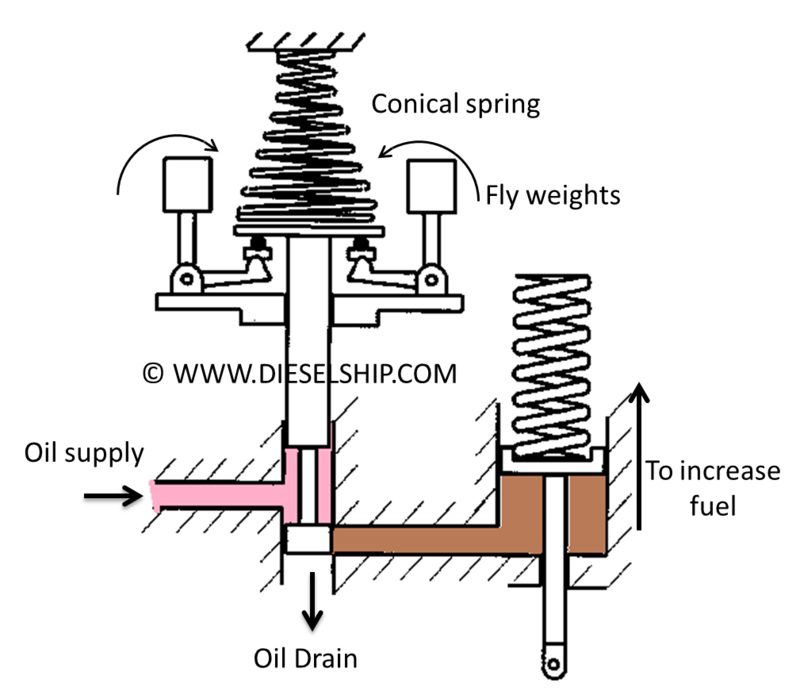 * This difference between the spring and the fly weights is called the governor effect, which is responsible for moving the pilot valve and hence the fuel rack. * Higher the governor effect, higher the sensitivity of the governor. Therefore to increase the sensitivity of the governor the centrifugal force has to be increased. 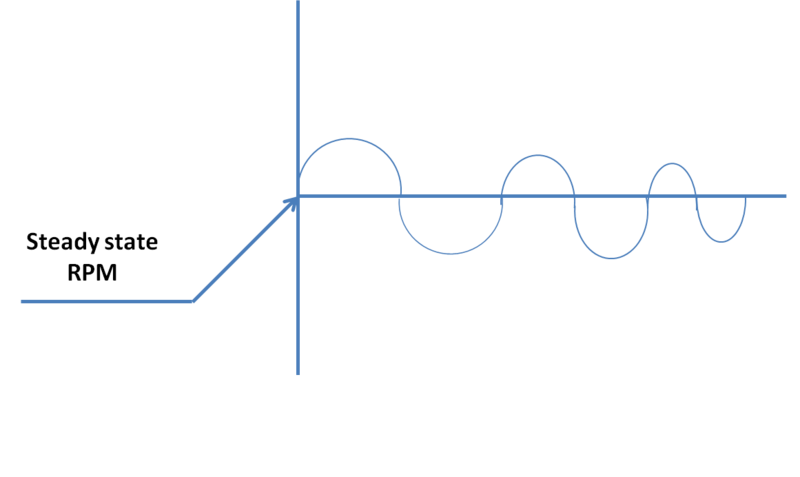 w = Speed of the rotation of the fly weight. – If we increase m ’mass’ the inertia effect will increase hence the sensitivity will drop as it take more time to act. – If we increase r ‘radius’ the governor becomes too big in volume and takes higher power to rotate the governor, hence drop in sensitivity is probable. – Increasing of ‘w’ is possible by increasing the speed of the rotation of the fly weight. Change in speed gives very high effect as the centrifugal force is directly proportional to the square of speed, additionally speed increase proves to be more effective, increased sensitivity, less power requirement, reduced size of governor. What is a dead band? Dead band is the change in speed required before the governor will make a corrective movement of the throttle. In other words, Dead band is speed of fluctuation around the steady state speed, in which governor will not initiate corrective action. In simple terms you could say it is the silent period of the governor at which governor doesn’t take any action. The dead band effect is reduced by increasing the sensitivity of the governor. Hydraulic amplifiers can be used to amplify the governor effect. Governor oil to be of low viscous oil so as to reduce the drag effect. Less mass of fly weight by using a hollow weight. Hunting is the continuous fluctuation of RPM around the steady state RPM is called hunting. Sensitive adjustment to be reduced and is not often adjusted. Reduce the friction of linkages. Oil quality to be maintained. No air locks to be present in the system, purging to be done as and when required. Use of trumpet shaped spring instead of liner ones, so that a more balanced relationship exists between the speeder spring force and CF is achieved over the whole of the speed range. How the output torque of governor is increased. * The output torque generated by mechanical governors is not sufficient to move the fuel rack which causes sluggish operation of the governor. * Torque may be increased by amplification of signal may be employed in the servo mechanism, where the secondary, may be designed for greater output torque then the primary, generating the governor signal. * The other most common method by a hydraulic system incorporated to the mechanical governor, for this reason a gear pump is provided inside the governor, which operates the power piston thereby amplifying the governor effect. Give examples of integral + proportional control? Give examples of proportional control on the ship.